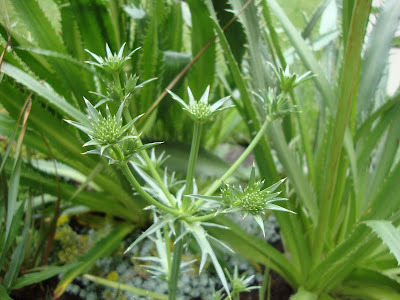 Eryngium is a genus of plants that I HATE to have to name out loud. I just can’t wrap my tongue around the word, pronounced “air-ING-ee-um.” This wouldn’t be much of a problem except for the fact that I LOVE them, in fact I’ve never met an “air-ING-ee-um” that I don’t want to take home with me (you should at least be able to say the name of everyone/thing you take home with you right?). 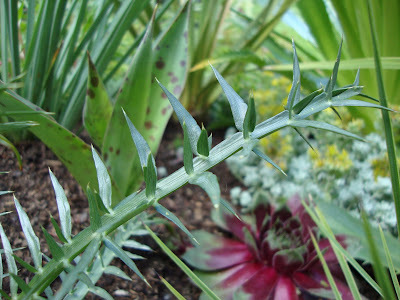 This love affair started with Eryngium agavifolium (which was the topic of one of my early blog posts), in the danger garden this is the work horse of the Eryngium collection. The foliage is so spiky! The original three that I planted have (in part, through divisions) lived on. And more have been added. Besides loving all their glossy spiky leaves I love the fact that their blooms are so attractive to bees. They simply adore them. I don’t suppose they are what most would call beautiful, but I think they are. Especially when back-lit by the morning sun. This one has an unusual flat-top style. Usually they are more rounded, like this. 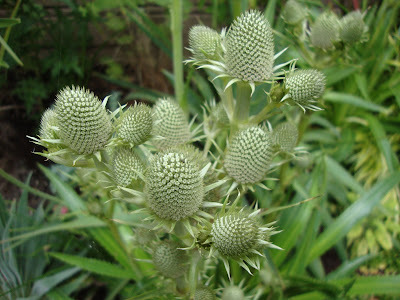 This year I added an Eryngium yuccifolium to the collection, it’s currently in bloom. Hopefully it will start to clump up soon, just one spindly little stem is a little underwhelming. But the blooms are nice. 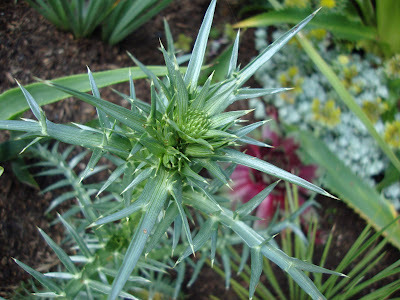 Eryngium venustum is another spiky favorite. And this year it’s blooming. 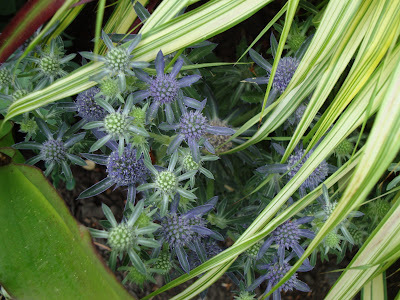 Eryngium planum ‘Blue hobbit’... ...takes its time turning blue. 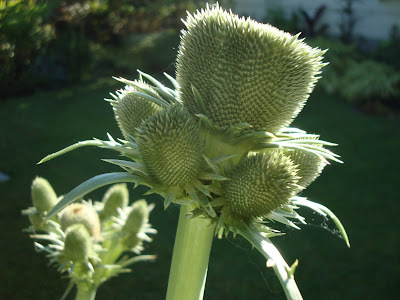 And the one I’ve loved and lost: Eryngium pandanifolium, here are its blooms. 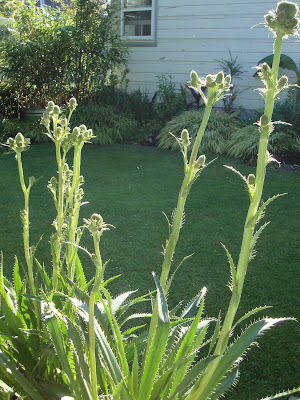 And those are its spiky strappy leaves on the lower right hand bottom of this picture. It fell victim to last year’s winter cold (that's the E. venustum in the center). 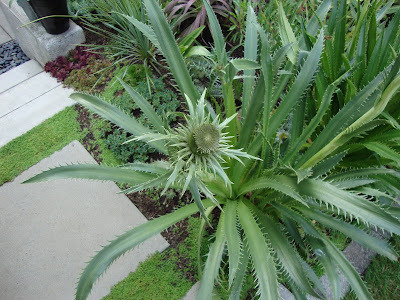 These big Eryngium pandanifolium were at Cistus, picture from a visit late last summer. Here it is at Cistus just this week, a little worse for the wear (winter damage) but still looking tall and spiky. I heard from another garden blogger who had bought one and it didn’t make it through the winter for her either. 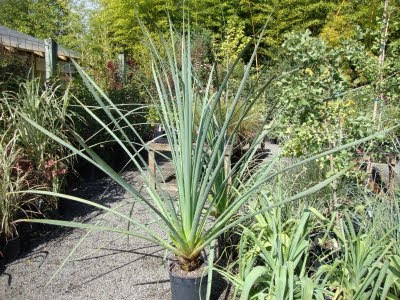 There are so many beautiful spiky (and hardy) ones out there, if you don’t have an “air-ING-ee-um” in your garden yet what are you waiting for!? You make air-ING-ee-ums look so easy. I assure you they are not! At least here in zone 10. And that's not for lack of trying. I'm thinking since I first saw these in English garden books, and they obviously love your PNW garden, that zone 8 is where they'd rather be. Heck you can probably even grow E. proteiflorum -- so jealous! I like saying eryngium a lot more than clematis. I always, always, fumble over it. Eryngium is sing-songy, but clematis just always ends up sounding like a venereal disease. Thats a mouthful alright! I have a hard enough time with the easy-ish ones. Somehow I always get the Latin ones wrong. Add or misplace an e here or there, and instantly look like a fool! Oh well! Your spiky plants are looking dangerous as usual! 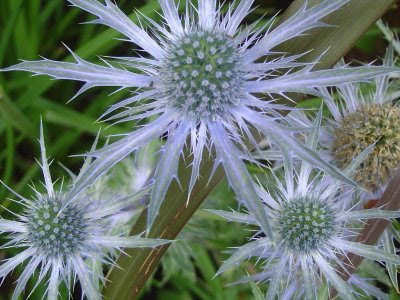 I love the look of sea holly, I just don't know where I'd put it. So anywhoo I was wondering if you could give me advise on an 'easy' (I know it's a subjective term) Agave that I could starter on, but still looks really cool. I regularly drool on the ones with the black edges and the ones with the lemon-y stripe (insert proper names here) that you often show on your adventures. Would any of these be applicable for a pretty pot in my zone 8 garden? I found the lady who orders Agaves at my local nursery, and am told she can order almost anything in If I want something specific. Help me want something specific! 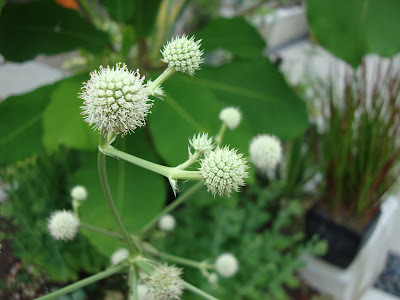 The common name 'Rattlesnake Master' is pretty cool. 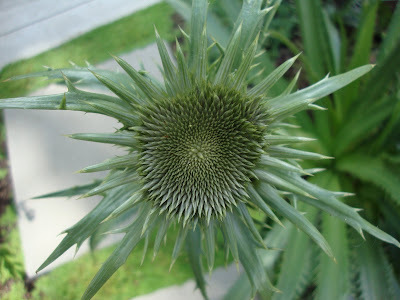 Preferable to 'sea thistle' or eryngium, I think. I'm with LeLo - ha-ha. I'm forever doing the wrong pronunciation of clematis. This is a cool plant. That Sea Holly is a lovely color. Great plants. Looks like they should be call "frogspearers." Eh, just call it whatever you feel like. That blue of Blue Hobbit slays me! I have loved and lost several air-ING-ee-ums over the past two winters, and the one that was supposed to "re-seed freely" didn't. I'm trying over with E. "Jade Frost" this year, because I love them too. They seem kind of like small, cool, globe thistles (echinops ritro)- another plant that definitely belongs in the danger garden group! Hmm... I've been pronouncing this wrong the whole time... air-IN-gee-um. I don't think I'll try to correct myself. only a few of these are hardy to zone 5 but they're fantastic plants. I wish I could grow a few of yours though! Oh ha, I always said air-IN-gee-um too. Whoops. Well, you set us straight on Knife-HO-fee-uh so maybe this will stick in my brain too. 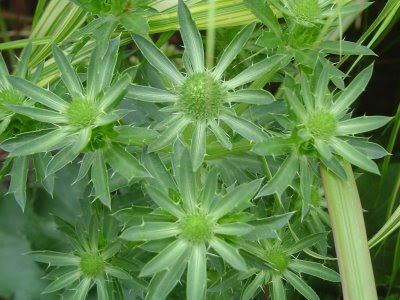 Or I will just be lame and call it Sea Holly. I have a wacky variegated one that I thought had died but it is struggling along. No bloom spikes yet though, that I can see. It's not in a very good spot, maybe I'll try to move it. Yours are stunning, and the flat-top one is hilarious! Denise, really? Wow...I won;t take them for granted anymore. 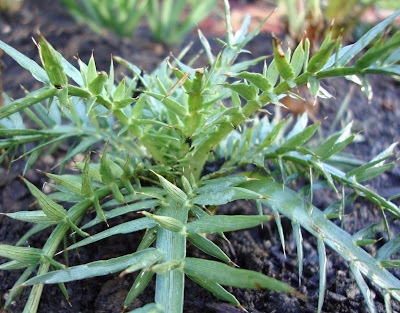 I've never heard of E. proteiflorum but I'll be on the look out now and if I find it I will grow it in your honor. LeLo, oh god, I so hear you on that one. I kind of revel in saying it wrong in honor of my grandma. Who, even though she said it wrong, had the most amazing clematis growing up the side of her house. Laura, Latin! Me too. Never can get it right. I really wish I could and I admire those who do. 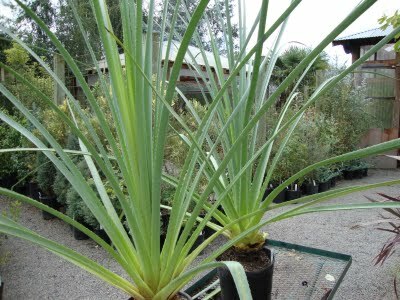 I'll be emailing you with agave suggestions...SO EXCITING! Anon, I agree. I could only find that name applied to a few of them, does it work across the board? Kate, that makes 3 of us. PGG, I like your attitude! MulchMaid, oh....I hope your 'jade frost' makes it! And I'll be looking into this one! Andrew, the first time I heard some one say it I had to stop them and ask them to do it again. And again. They must have thought me a real freak. Karen, you really should try the E. agavifolium...they are fool-proof (not that I am calling you a fool). You can really judge a gardener's character by how s/he corrects one's mispronunciations. And I can tell you, I have had many opportunities. However you say it, some of these are a must. Oooh, I love these guys. There are so many plant names I still have trouble pronouncing. Fine Gardening's pronunciation guide is helpful. Hi puggy gardening dog! Nice to meet you. I met one of your friends, at a 'Growing Gardens' benefit last night and she sent me over. I like your garden! 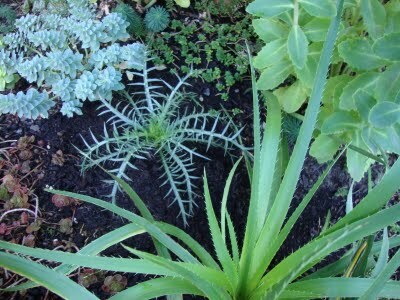 Love these plants, E.venustum survived -17 (celsius) in my garden, wet soil. One of the most wonderful Eryngiums must be E.maritimum (native to all sandy beaches in Europe), totally hardy and the best foliage.